Terry Chan Photography: We're Sectional Bound Once Again! Well, we squeaked out another one. We beat Claremont 3-2 today so we're going to Sectionals in August. Even though I lost today with Steve Mak, Lawrence and Dave really came through for the team by clinching the win via a 3rd super-tie-breaker. Above is out team photo, minus a couple of players (Andy Neff, Ernie Ong). 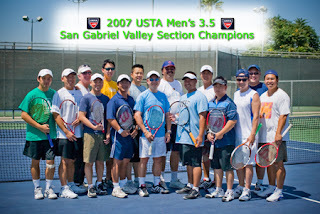 We will be competing at Los Caballeros Tennis Center in Orange County on the weekend of 8/17-8/19. This is an added bonus since Lan's Ladies 3.5 team (read previous post) are also going to the Sectionals on the same weekend. This is going to be fun and exciting.